The model and its construction are reported in Oligopoly.pdf. The code of the project is at https://github.com/terna/oligopoly. We have also the slides of an old presentation of the Oligopoly model at WEHIA 2017. An article, Business Cycle in a Macromodel with Oligopoly and Agents’ Heterogeneity: An Agent-Based Approach, (2017) of M.Mazzoli, M.Morini, and P.Terna, discusses the model and its results (if you experience problems in reading, please use Firefox). [Look at Erratum below]. 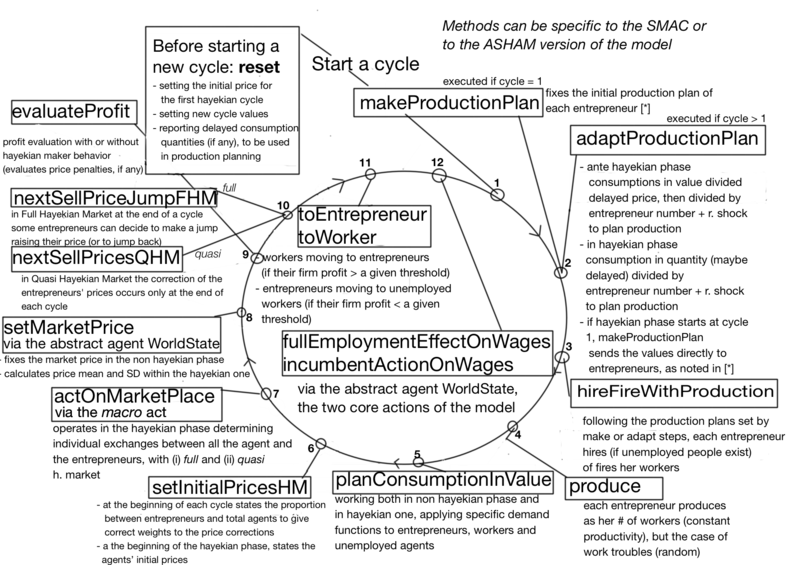 The Oligopoly model uses SLAPP as its agent-based modeling shell. To run a specific case of the above quoted article or of the incoming book Rethinking macroeconomics with endogenous market structure of M.Mazzoli, M.Morini, and P.Terna, please look at the Appendix C of the book itself or to the file runningSpecificCases.md. Erratum for the paper above: in Table 1, the Expected employment ratio at t=1 is 0.9 and not 0.8.